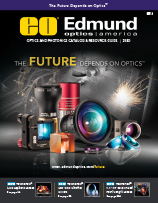 Enjoy your Edmund Optics Optics and Photonics Catalog & Resource Guide, Imaging Optics Catalog, and Optics & Technology Selection Guide in a convenient digital format. Fully linked to the EO website, our digital catalogs allow you to easily browse, print, and share your favorite products. Featuring 244 pages of optical, imaging, and optomechanical components. Plus, you’ll find volume pricing, tech notes, and selection guides — all designed to make your purchase easy. This catalog is a must-have resource for optical researchers, designers and OEM users. Available only while supplies last. New for 2019, this 164-page catalog is a technical resource for laser optics solutions. Containing over 50 pages of tutorials, a wide range of precision products, plus equations and terminology, this valuable resource was designed to help you understand the complexities of laser optics. Order it while supplies last. Featuring our best-selling products and application notes, this web exclusive catalog includes 20 selection guides! Discover our wide array of optical components and imaging optics that will best integrate into your next application! Browse our most popular products including optical, imaging, and optomechanical components! Learn about the EO Advantage to help you choose the best fit for your application! Explore selection guides and application notes to ensure your next application will be a success!